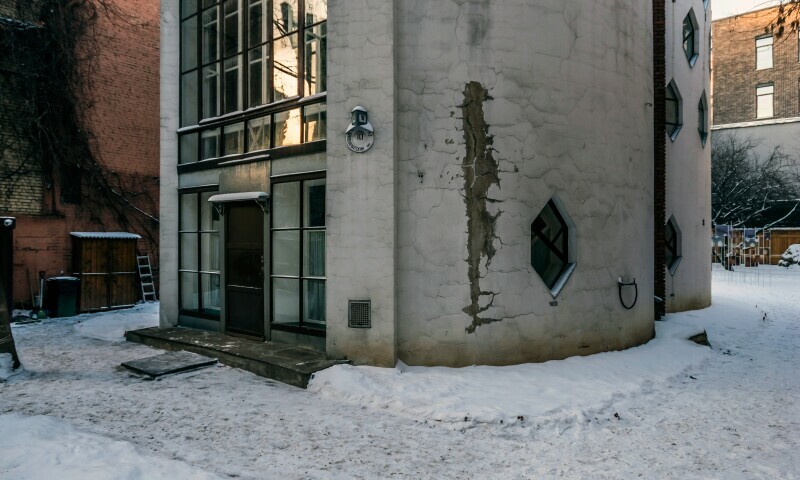 Konstantin Melnikov designed this 'experimental cylindrical house' as a Moscow home for himself and his family that also demonstrated his concept for social housing. The building consists of two overlapping cylindrical towers, each nine meters in diameter each, and without any load-bearing walls or columns. The wooden ceilings are constructed from rectangular 'grids' of planks, while over 60 distinctive 'honeycomb' windows provide an evenly dispersed light and carefully engineered heating and ventilation. Its original layout, elegant interior spaces and innovative technical construction quickly made it world famous. Melnikov described the building's 'essence' as 'the even distribution of weight, light, air and heat'. It had one bedroom for the whole family, partitioned by screen walls.